Japanese TV spot also released. 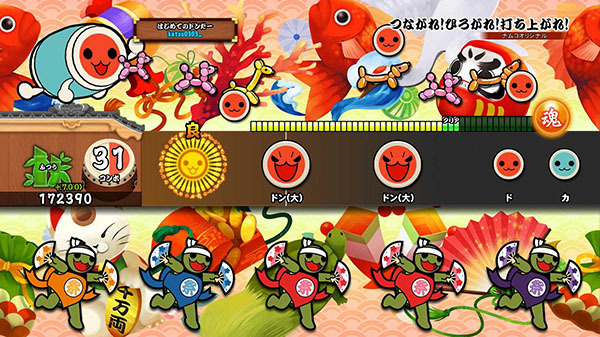 Bandai Namco has released a demo for Taiko Drum Master: Drum Session for PlayStation 4 via the Japanese PlayStation Store. The demo features classic song “Carmen Kumikyoku Ichiban Shuukyoku” by Bizet, game music “Eat ‘Em Up!” from R4: Ridge Racer Type 4, and Namco original “Tsunagare! Hirogare! Uchiagare!” Save data from the demo cannot be carried over to the full version. If you missed it, read up on everything we know about the drumming rhythm game here, here, here, and here. Taiko Drum Master: Drum Session is due out for PlayStation 4 in Japan, as well as in Southeast Asia (Singapore, Malaysia, Thailand, Philippines, and Indonesia) with English subtitles, on October 26. In addition to the demo, Bandai Namco also released the first Japanese TV spot for Taiko Drum Master: Drum Session. Watch that below.